Duo bands seem to be quite popular nowadays. The Sonflowerz, One Sonic Society, Capital Kings, Love and the Outcome and the currently ever-quiet City Harbor are just some examples of duos that have been popular over the years, and with LoveCollide presenting to us parallels musically between them and other disbanded artists like BarlowGirl and Superchick; LoveCollide’s sound is a great way for nostalgia, and a well-rounded alternative if you are nevertheless still missing both these aforementioned defunct bands, even after a few years of them disbanding. Formed with sisters Lauren and Brooke DeLeary, the band LoveCollide has delivered sonically, stylistically and musically on their self-titled debut released in 2014, and now with their new album releasing April 29th, we see a sense of maturity, and songs that still inspire, evoke emotion and motivation, as well as encourage us to resonate to the people we are in relationship with- that once our resonation of God’s love is shown to the world, it’ll spark into a ripple, impacting everyone who comes in contact with us in our daily walk in Christ. While I may have wanted this album to be a tad longer (never fear, Resonate: A Spark into a Flame releases October 2016), both Lauren and Brooke DeLeary are certain to be signed in the future (if that is what the duo wants) as we are reminded of the great quality of indie Christian pop in the music industry currently. Standing at 8 tracks in length, LoveCollide err on the side of worship with a slight pop/rock twist, and pull off each song with grace, emotion, power and an enthusiasm that I haven’t really heard from an indie band in quite some time (in fact, the amount of passion that has been exuberated by the duo was last matched, in my opinion, by Julie Elias on her album Unbroken). Starting the EP/album with the title track, Brooke and Lauren DeLeary bring to us commanding electronic keyboards and a powerful drum kick backdrop as we hear the resounding words of how ‘…Lord I give You everything, though I don’t have much to bring, take this humble offering and turn, a ripple to a wave, a spark into a flame…’, and the ever-relatable theme of asking the Lord to take whatever we have to give and offer and expand upon it so that what we have, can impact those around us as we share in God’s love with our fellow friends and neighbours. “Resonate” is a call from us to God, inviting Him to allow our lives to resonate- to produce a sound, an emotion, a response from us that is indeed infectious, powerful, life-changing and life-giving to all those who come in contact with us in everyday moments. A great song to start this 8 track project, well done to both Brooke and Lauren for a song that is much needed to hear in this society. Originally recorded by pop artist V. Rose on her album Young Dangerous Heart, “Storms” wasn’t written by either V. or Brooke and Lauren, but rather by worship leader and Provident Label Group artist Mia Fieldes. Quite possibly one of my favourite worshipful songs I’ve heard in 2016 thus far, the song stands at a somewhat short 3:20, yet it is the harmonies of Brooke and Lauren that make this song as catchy as it is. Its theme is somewhat simple yet equally profound- that God stills the storms in our lives. It is a revelation that could mean heaps for many, or maybe not much to some. Yet the fact that God calms all the chaos in our lives is most definitely liberating. God walks before us, and “Storms” is certain to be a song that is worthy enough to declare in good times and bad, that God in fact ‘…still[s] the storms…I have only ever known You to be the One who does what they say will do…’ “Follow” is the other ‘cover’ on the EP, written by Mia Fieldes, Francesca Battistelli and Seth Mosley. Standing at 2:44, this catchy pop song through-and-through is one that encourages us to follow Christ and everything that He stands for, no matter what the cost. With light acoustics and heavy electronic keyboards, the layering vocals of both Lauren and Brooke on “Follow” makes me miss powerpop CCM groups like ZoeGirl, Superchick and BarlowGirl even more. Who knows, maybe LoveCollide, alongside 1 Girl Nation, can fill the void left by these three bands? 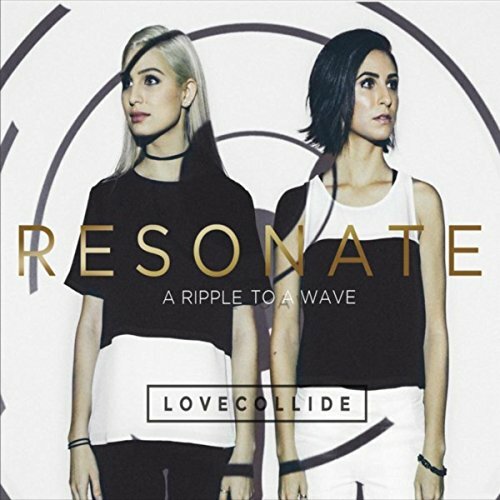 Kudos to both Brooke and Lauren for such a poignant melody, one of my favourites on Resonate: A Ripple to a Wave. It can seem strange for the acoustic guitar to play alongside the saxophone in “Fox”, yet the two instruments seem to complement each other in a song whose theme it is to remind us to be wary of the fox (not a literal one), being on guard and mindful of what Satan may throw at us. It is the phrase of how we ought not to ‘…let the fox creep in, little things try to steal and win, all they want to do is bring you down, don’t forget about the love you’ve found…’ that challenges us the most in “Fox”, as will be Brooke and Lauren’s story behind the song- ‘…[the song] is taken from the song of Solomon when we are warned about not letting the fox creep in. If we are not careful to guard our first love, the little things can creep in and distract, or steel joy and peace…’ “Breakthrough” is as personal as they come, with the band unveils personal vulnerability, relaying the thoughts of things that David had said during some chapters in the Psalms. “Breakthrough” is asking for God to break through, to show us that He is in the moments when we can’t feel Him, or even know He’s there yet circumstances tell us He’s not. With a lot of vocal distortion and eerily calm keyboard sounds, “Breakthrough” is a great song for a band like Fireflight or Superchick to record…who knows, maybe the influence surrounding this song was from these two aforementioned bands? Throughout the rest of the EP, the band relay a countless array of themes that are pertinent to the Christian life and all its facets. “Atmosphere” is a testament to how we are not part of this world, existing for only a moment to travel towards a place that we belong- heaven with our God; while “Fighting on Our Knees” is the rockiest melody on the EP, a song that a band like Skillet or Switchfoot may record. At 3:06, there is no ‘filler’ lines, as the chorus declares that ‘…I’m stronger when I’m weak, because You fight for me, I’m victorious in the name of Jesus, You are with me, when I’m fighting on my knees…’ To fight on our knees is to look at our problems with the solution of prayer, being reminded that our battles are indeed not against flesh and blood, but rather against Satan and his minions- with “Fighting on our Knees” hopefully being our battle cry for weeks and months to come. “Yahweh” is the last track on the EP, and is by far one of my favourites. A worship track through and through, this lightly acoustic melody full of reverbing percussion and a great harmony between Brooke and Lauren, we are encouraged through the testimony of the sisters when they were creating the song- ‘…there is so much power in the name of God. Yahweh is one of our favorite names for God. It is the full essence of who God is. We are calling on him to invade each heart, each city, each state, and each nation until His presence fills the entire earth. We want more of Him and for Him to show us His glory. Some songs are simply written by Holy Spirit and and that was the case with this song…’ Well done Brooke and Lauren for “Yahweh”, that, along with songs like “Storms”, “Follow” and “Resonate”, anchor the album musically and lyrically. What is special about LoveCollide’s new album is that it has been released in parts- A Ripple to a Wave released on April 29th, while A Spark into a Flame releases at the end of October. So if you feel like this album is somewhat incomplete (because in fact, it kind of does- at the end of the 8 tracks, I felt that the album was a tad too short, and maybe a few songs missing), then we’ll know new tracks will be coming at the end of October 2016. Nevertheless, the collection of these songs are still a joy to listen to, and compared to their debut album two years ago, are much more refined, powerful, poetic and poignant as these 8 tracks continue to keep the Lord as its focus, while each song delving into a particular theme and making vertical worship accessible to those who may not necessarily sway to music of that variety. Not many people are inclined to listen to music of artists like Phil Wickham, Kari Jobe, Chris Tomlin or even Crowder, so hearing LoveCollide fuse together worship and pop is a great alternative for people who want to listen to worshipful music without listening to worship music…if you get my drift. LoveCollide may still be relatively new on the music scene, and it is Resonate, both parts, that’ll place these artists on the map. Who knows, maybe they will be signed to a major label in the future.